Husband. Father. Recreational writer. If you enjoy my articles, please click 'like' and consider subscribing. Topics and suggestions always welcome. Sydney is blessed with a huge range of succulent steakhouse options that cater for just about every budget and appetite. Scan anyself respecting steak establishment's menu and you'll be bombarded with terms like Wagyu, Angus, grass fed, grain fed, wet aged, dry aged, marbling scores and more. Sydney's steak connoisseurs will be very familiar with these terms and the usually excellent quality of meat that they represent. While the dining demand for premium quality Australian beef has steadily increased over the last decade, there are still a minority of steak eaters who are more interested in quantity than quality (not that one always excludes the other). Its people like this who are the target of Australia's niche big steak market. The big steak market is a small one. It's true that not many people consider trying to put away a 1kg rib eye in a single sitting. This can make it difficult for those craving an oversized hunk of meat to find somewhere that serves a steak big enough to satisfy such meaty appetites. So where exactly in Sydney can you sink your teeth into that elusive big steak? The following 5 hotels and restaurants offer real deal big steaks that are guaranteed to satisfy the quantity carnivore. Starting in Sydney's West, we begin with the Rooty Hill RSL Zest Grill House. Zest Grill House offers the monstrous and hard to find 'Tomahawk' steaks – huge eye-popping Rib Eye cuts. 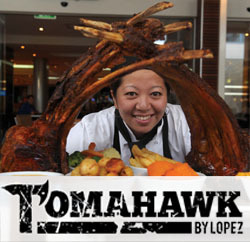 Zest serves the Tomahawk in 5kg and 1.2kg sizes. Not even the most hardened big steak eater would try to attempt 5kg alone (usually served to 6-10 people), so the challenge is to try and conquer the 'Baby' 1.2kg Tomahawk. If this doesn't leave the seasoned meat eater satisfied, nothing will. Due to the preparation time, orders for the 'Tomahawk' steaks must be made at least 24 hours in advance. You can make a booking online here. 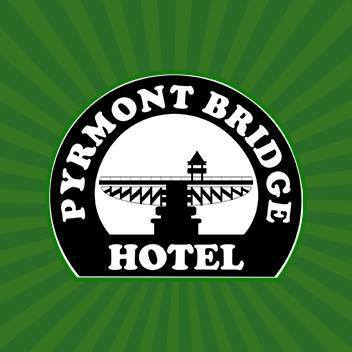 Pound for Pound, the Pyrmont Bridge Hotel offers one of the best value for money steaks in Australia – a massive grain fed prime rump for under $40. Washing this slab of meat down with a pint (or 2) of the Pyrmont's tap beers is a more than worthy challenge for any big steak eater out there. Definitely Sydney's biggest and best steak for the budget conscious carnivore. 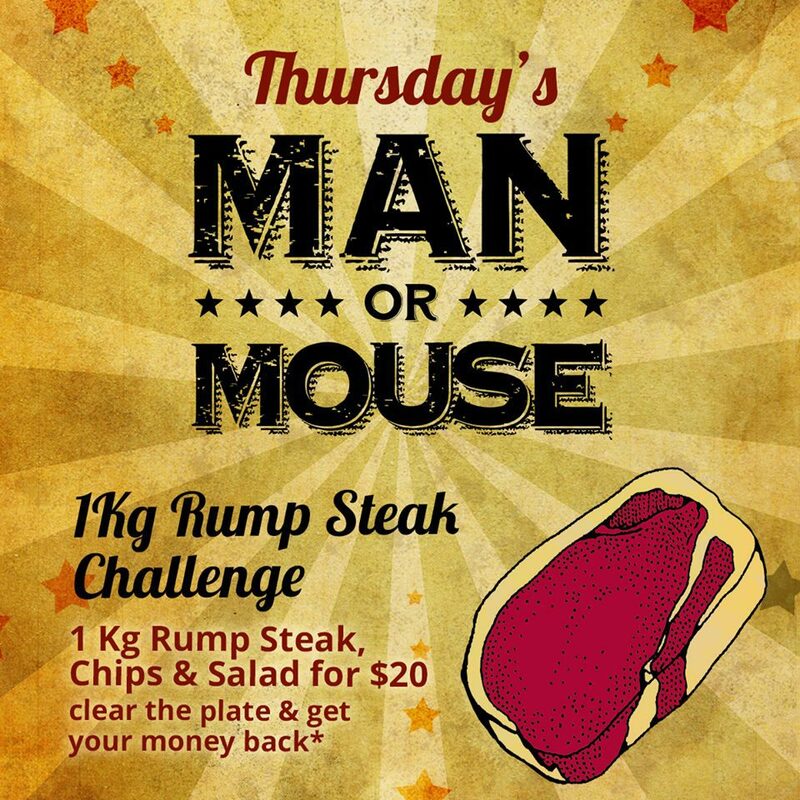 It is also worth noting that the Pyrmont have recently reintroduced their popular 1kg rump steak 'Man or Mouse' challenge. Only available on a Thursday night, you can take the 1kg rump (with sides) challenge for only $20. That's no typo. 1kg of rump for $20. But wait there's more - clear your plate and you'll get your $20 back. 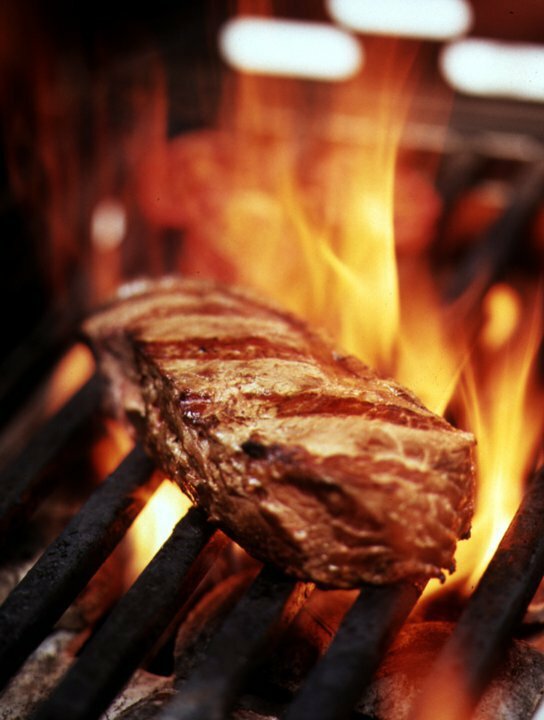 Here's your chance at a FREE 1kg rump steak. Game on. 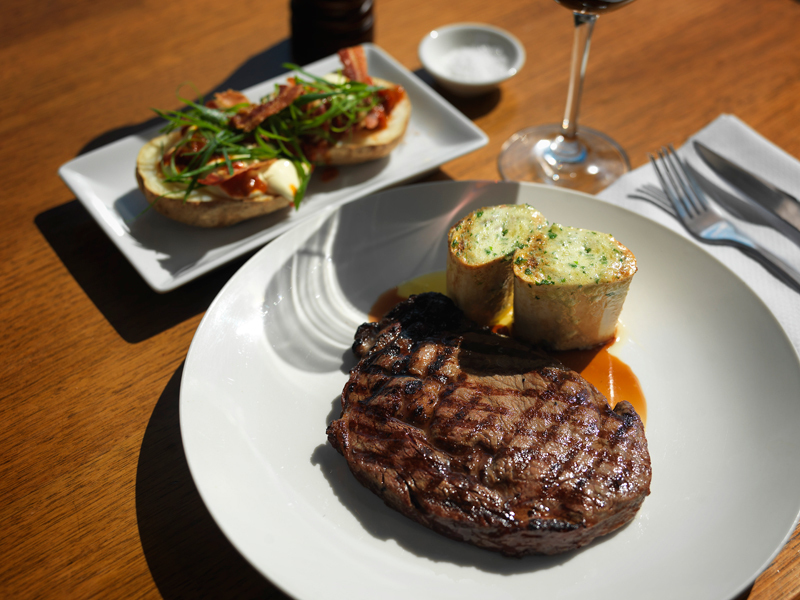 Kingsleys is an up-market option among Sydney's biggest steaks. Offering genuine superb quality steak cuts, Kingsleys signature Wagyu Rib Eye on the bone is their addition to the big steak scene. This huge Rib Eye comes with a marble score of 6, meaning you'll be feeding on melt-in-the-mouth premium meat. Size and quality like this doesn't come cheaply, so be prepared to fork out for the experience. 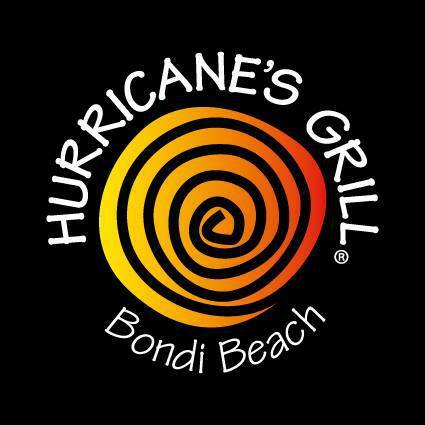 Sydney's iconic Bondi Beach is home to Hurricane's Grill and Bar. 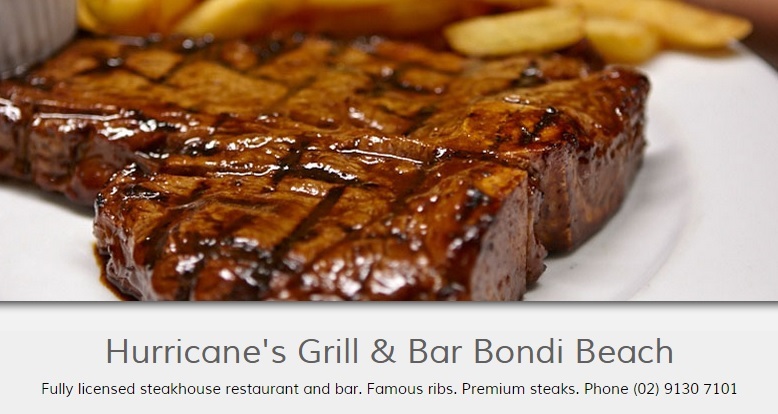 So far we've covered rumps and rib eyes – here Hurricane's adds a T-Bone to Sydney's big steak options. Always a quality cut of beef, this T-Bone will give you a massive return for a relatively moderate investment. 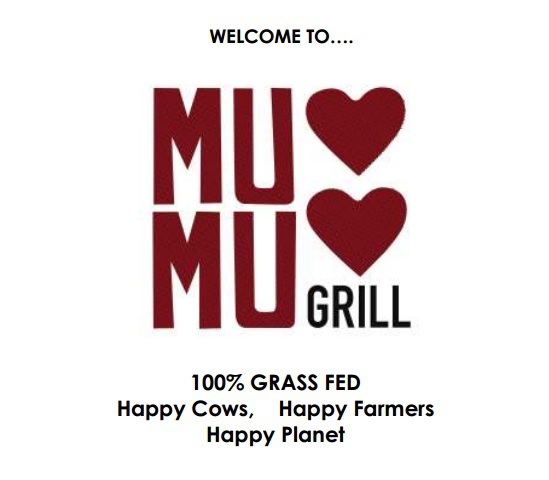 Mumu Grill is the only steak restaurant in Sydney that serves exclusively 100% grass fed beef. Here you will find another 'bang for your buck' monster T-Bone. 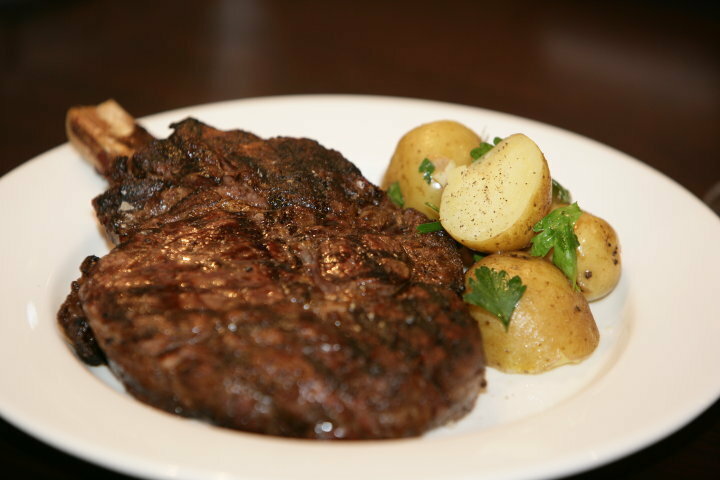 Mumu's T-Bone comes seared, sliced and seasoned with garlic and rosemary. This bad boy is sure to leave you satisfied without breaking the bank.